Kundan Lal Saigal, regarded as the father of ghazal singing in Hindi films, started his career as a time-keeper in the Indian Railways. He also worked as a salesman in Remington Typewriters. While doing these odd jobs, his passion for singing continued unabated. When he went to Kolkata in connection with the sale of typewriters, R.C. Boral, well-known maestro, heard him humming a song at a ‘paan’ shop. The maestro was awestruck by Saigal’s vocal virtuosity. He took Saigal under his wings. Under the keen supervision of Boral, Saigal’s musical prowess was sculpted. His talent for singing ghazals developed into a style encompassing expressiveness. With Chandida’s numbers such as ‘Premnagar mein bassaaoonga ghar main, Tadpat beetatdin ren, Prem Ki ho jaikar..’ etc, Saigal created film singing in the nascent talkie era in the 1930s. With Devdas numbers such as ‘Balam aye baso more mun mein, Dukh ke ab din beetat naahen, Piya bin naahi aawat chain..’ Saigal portrayed the toils, turmoils and tribulations of a dysfunctional drunk mourning his lost love in an abyss of despair. Saigal came to Bombay in 1942 to play Tansen in Jayant Desai’s pseudo-historical film on the legendary musician in Akbar’s court. The world paused to listen to the spontaneous flow of emotions that Saigal instilled into ‘More baalapan ke saathi (with Khursheed), Diya jalao, Sapt suran teen gram..etc. Singing ever-greens like ‘Nuktacheen hai gam-e-dil, Babul mora naihar chhooto jaye, Karoon kya aas nirass bhaee, Main kiya janoo kia jadoo hai, Aye katib-e-taqdeer mujhe itna batta de, Dil teri se nigaah jigar tak uttar gayee, Toot gaye sab sapne mere..etc, Saigal overshadowed talented heroine-singers like Kanandevi and Khursheed. Discarding the ‘strong-throw-singing’ which was popular for stage-singing, Saigal captivated music lovers by his low-pitched songs. Be it a bhajan like Maiya mori main nahin makhan khayo..’ or a lullaby like’ Soja Rajkumari soja..’ or a tipsy number ‘Piye ja aur piye ja..’ or a soul-stirring ghazal ‘Jab dil hee toot gaya..’ etc or a ‘Geet’ ‘Madhukar sham hamare chor..’ Saigal imparted the heart-rending quality to his songs which left music lovers awestruck. Acting for him was only a means to display his singing prowess. In his scheme of things, music was always subordinate to his vocals. His voice was timeless as were the emotions/sentiments he sang about. When he sang ‘Gham diye mustaqil kitna nazuk hai dil..’, he sang for the lovers who lost their love and suffered the anguish of separation. When he sang ‘Kahe ghumaan karey ri gori..’, he cautioned the beloved that beauty was transient. He endeared himself to children with ‘Ik rajeka beta lekar urne wala ghora..’. Before Saigal, poets used to recite their verses tunefully. Singing of ghazal was looked down upon as it was apprehended that the melodious voice of the singer overshadowed the meaning of the verses. Saigal employed his vocal modulations and articulations to portray the poetic contents of ghazals like ‘Aaha ko chaahiye ik umar assar hone tak, Laayee hayaat aaye qazza ley chali chaley. Saigal recorded about 250 songs in his career spanning about 15 years. So much so that the period from 1932 to 1946, is known in the Hindi film world as the Saigal musical era. 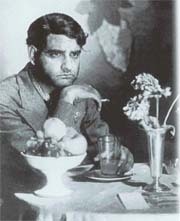 Many singers tried to imitate Saigal’s style, tone and tenor. If Talat Mahmood’s first song ‘Sab din ek samaan nahin thha..’ reminds us of Saigal, so does Mukesh’s ‘Dil jalta hai to jalne de..’. C.H. Atma sounds like Saigal in ‘Preetam aan milo..’, Surrender in ‘Aawaaz de kahan hai..’ and Kishore Kumar in ‘Jagmag jagmag karta nikla chaand punam ka pyara..’ could not resist trying a Saigal style. The young Rafi virtually requested to Naushad to allow him to sing with Saigal the last lines of ‘Mere sapno ki Rani..’. When Suraiyya got a chance to act with Saigal in Parwana, she was so overawed that she could not sing even one duet with him. Besides music, alcohol was another passion with this king of cadence. His fondness for the bottle is an open secret. He believed that alcohol lent ‘soz’ to his singing. He started recording his songs when fortified with liquor. During the recording of Shahjahan numbers, Naushad persuaded Saigal to do a take before his ‘Kali Paanchh’ and one after it and see the results for himself. This done, Saigal was made to hear both the takes when sober. He realised that he could sing better without alcohol. He sighed, "Naushad Ali, if only you had convinced me earlier. If alcohol had not consumed me I could have given the world so much more joy through my songs". The realisation was too late and alcohol had taken its toll and he left his fans in mourning with his untimely death on January 18, 1947. However, the appeal of Saigal’s songs is eternal and enduring. The freshness of his songs is undiminished by time. Music lovers would cling to his memory for all time to come.